Lewya had the most liked content! Which two scores would you recommend to a complete novice and why? I would never go for the poor Titanic or a relatively mediocre pastiche score like HP 3. Neither of them are "essential" nor do they represent film music at its best. You could argue that Titanic is even a score that gave film music a bad reputation. A Streetcar Named Desire and East of Eden would be two good candidates to begin with though I think. Why? Because they used modern music and both of the scores contain music that represents film music at its best. At their best, they have never been surpassed in the field. Both by two of the most formidable composers to ever work in the field as well. Yes, I don't like Alfred Newman's music much - I said more original and individual - not more late romantics. Oh, I prefer T. Newman almost any day over Williams. Of course, these days I don't feel that attracted to Williams's music. I prefer more original, individual and inventive composers over him. Newman for instance, I feel far more attracted to and close to. There hasn't gone by a month where I don't listen to any of Newman's music, but there have gone months where I don't listen to Williams. Too much of Williams music is way too bombastic for my taste. My taste in music is generally more alternative, experimental... ambient music. Almost the opposite from the stuff Williams usually does. And when I listen to Williams, I easily prefer things that aren't any of the Star Warses or E.T. Close Encounters and A.I. are my two favourite JW scores. The Wind and the Lion is top 20 Goldsmith material and the best one of the three, The Mummy, I am not sure would crack his top 20. It is a solid score and one of his best of the 90s together with Mulan and Basic Instinct, but a bit too cheesy for my taste, I almost never listen to it. Never had any affection for The Ghost and the Darkness, but it isn't bad, it is still a decent score. But overall, none of these three scores is something that I listen to, even if especially the first two are good. I don't think my preferences are very realistic, I admit that. But I still wish he went beyond the predictable for someone else. I am tired of Zimmer automatically being the go-to man for your promising blockbuster. Goldenthal would have certainly been up there among my top choices, but I admit, it is not very realistic. Same with Brian Eno and Cliff Martinez (he is more realistic than Eno) if it is an electronic score, I tend to prefer their more ambient sounds over Zimmer who is usually more bombastic. Shore in more alternative/experimental mode or Newman (who doesn't seem like a good fit on paper, but who usually delivers) would also interest me far more than Zimmer. I agree with some of these, especially Goldenthal, Shore and Martinez. Maybe Vangelis too, but he is almost retired now. Gabriel would interest me too, at least if he could deliver something like Christ again. I prefer Zimmer over Murphy, Young and Jones. Zimmer. Hopefully it won't be another horrible Dunkirk score. His Blade Runner score was just OK. The most recent Zimmer score I really liked was Inception. Not a big fan of Zimmer at all though. It is extremely rare that a film composer receives this kind of attention from leading concert composers, so Rosenman must have done things right. Both John Adams and John Corigliano are fans of him, especially of East of Eden and Rebel Without a Cause with Adams favoring the latter and Corigliano the former. Rosenman himself considered East of Eden his best score. Here is what John Adams wrote about Rosenman in liner notes in the East of Eden and Rebel Without a Cause recording he conducted: Leonard Rosenman is an important transitional figure in the history of film music: a highly skilled composer whose best work evolved during a critical period between that of old school Europeans like Max Steiner and Dimitri Tiomkin and that of the later, more pop-oriented composers of the 60s, 70s and beyond. Rosenman was doubtless one of the most thoroughly schooled musicans ever to work in Hollywood. Before making an acquaintance of director Elia Kazan in New York in 1954, he studied composition and theory at the University of California, Berkeley with Roger Sessions, the most serious of all serious composers. He was thoroughly familiar with all the latest modern techniques in the works of Stravinsky, Bartók and Schoenberg. Most importantly, he possessed one thing Sessions lacked: the common touch, an ability to mirror the American vernacular experience in his music. This was an essential ability for anyone hoping to make a successful foray into commcercial film music. East of Eden, Rosenman's first score was an ideal vehicle for his talents. The John Steinbeck story combines homespun simplicities of mid-century American social realism with the darker, more symbolic themes of filial disobedience and Oedipal search for his the lost mother. Set among the lush and irresistible beauty of the northern California coast, this 1955 film took the young James Dean into almost instant celebrity in the role of the tormented, misunderstood and unappreciated brother and son. The story, with its consciously Old Testament motifs acted by an ensemble of exceptionally gifted performers, including Julie Harris, Raymond Massey and Burl Ives, is one of the better examples of what a major Hollywood film could achieve. Rosenman's score is, when required, appropriately evocative of a "simple" American past (the story takes place during World War I). He utilizes both the widely spaced harmonies and simple diatonic tunes made famous by Copland, but Rosenman's ideas are never whole-cloth borrowings. His music has its own originality. The famous "Main Theme" with its innocent, almost childlike 3/4 lilt is one of the most memorable melodies in all American cinema. The music matches the qualities of Steinbeck's prose with uncanny exactness, at one moment being simple and plainspoken to the point of rusticity, and then modulating abruptly to a suppressed brooding that is far more sophisticated and self-aware than any earlier example of music for the screen. Written a year later, Rebel Without a Cause was musically even more successful, although the film, with its portrayal of misguided, troubled American youth, lacked the depth and richness of the Steinbeck story. While East of Eden was a period piece evoking for the American viewer an already lost idyllic past, Rebel Without a Cause was harshly contemporary and showed a strong influence of film noir in its treatment of the subject and characters. It may well be the film that created the whole "Fifties" stereotype, with its pompadour male hairstyles, car fetishes, and gangs of disaffected teenagers given to casual violence and unable to communicate with their uncomprehending elders. It is perhaps not insignificant that his film predates the premiere of West Side Story by two years. For the film, which provided another starring role for James Dean and an early appearance by all-too-worldly Natalie Wood, Rosenman created a complex score that moves effortlessly between the urban big band jazz of Stan Kenton and the moody atmospheres of Bartók and Stravinsky. Bartók's Music for Strings, Percussion and Celesta, hardly known to the general public in 1955, makes a particularly evocative model in film's "planetarium" scene, during which the 50s' newfound preoccupation with outer space and extraterrestial events is eerily worked into the film's existential themes. The fractured rhythms and polytonalities of Stravinsky's Rite of Spring are felt in the scenes of violence and terror, although here, as elsewhere, Rosenman never loses his own original voice. Unlike many a lesser film composer, Rosenman managed to avoid resorting to hasty pastiche or overt borrowing. The two scores show what could actually be achieved when a skilled composer and a director sensitive to the powers of music were allowed to work together under conditions of artistic freedom, unimpeded by the crush of market forces - a rare moment in an industry in which art and money always maintain a difficult equipoise. - JOHN ADAMS During Sunday's pre-concert talk, conductor John Adams – who recorded Rosenman's East of Eden and Rebel Without a Cause suites for Nonesuch in 1995 – described the composer as "one of the most important, skilled and knowledgeable of all film composers." "Adams took the microphone during the concert to extol Rosenman's virtues, calling him a "sophisticated composer" who helped to bring "psychological depth" to 1950s films like Rebel Without a Cause." John Corigliano: "East of Eden with Leonard Rosenman's music, is a great film on every level. It's like a combination of Berg and Barber and it's beautiful, and it has a simple American melody also of pure innocence. That score is great. It's so powerful, and in addition to that highly chromatic and nervous, wonderful sinewy beauty he also has an innocence like Copland. It should have a symphonic version played by major orchestras". My own favourites, aside from East of Eden being my absolute favourite Rosenman score - a score that reside within my top 25 film scores of all time, I think I even mentioned it among my top 10 the last time I did a top 10, include Rebel Without a Cause, Fantastic Voyage and A Man Called Horse - those are the four big Rosenman's favourites I have. I might be alone, especially on this forum, but I prefer Rosenman at his best music over Williams at his best. Williams has more "good" scores to his name, but I still prefer Rosenman's best music over Williams's best music. I might also rank Rosenman above Williams on a top 10 film composers list. Blade Runner by far in both categories. Both the score and film is top 10 of all time material. 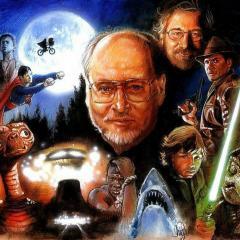 Michael Daugherty: "The wonderful music of John Williams is old school: you hear counterpoint, counter melodies, great orchestrations, changes of tempo and rubatos. I must say, I miss the old days of film music; the scores of Alfred Newman, Max Steiner and Bernard Herrmann for example. That way of composing virtuosic film music may come back someday, but at the moment we are in a very technologically driven world of film music, that, in my personal opinion, has inhibited the creative possibilities." He did (and yes, I know that there are more modernistic elements in his score, but still that is not what most of the score was about, it was retro). Another poll, I need to know what people here prefer - for fun. The Shawshank Redemption for me on both counts - Shawshank is one of my top 25 scores of all time, Schindler's List wouldn't even make my top 100. The Shawshank Redemption is simply a stunning score, Williams himself singled it out as one of the most impressive scores he had heard from the younger generation. The Schindler's List score may be good (I easily prefer Jurassic Park from the same year though), but it was never one of my favourite Williams scores and I feel it is probably even overrated. I find the score too maudlin and sentimental - the obnoxious choral moments are easily the worst. Newman's understated, moving and elegant effort is clearly the superior score for me. I still listen quite regularly to a handful of tracks from Shawshank - and it is a joy, but pretty much never feel the need to revisit the Schindler's List score. Which film and score do you prefer, The Shawshank Redemption or Schindler's List? Lambs for film. For score, it is more even, I made a mistake and voted for Seven, it should have been Lambs. Tricky question. I am not a big fan at all of JW's concert works, but if pressed for a favourite, then Five Sacred Trees and Trunks, Branches and Leaves from Treesong is maybe my favourite movement, but since that doesn't count, then I am not sure what my favourite movement is, so I voted for the same work there too. My least favourites ones that I have heard are probably the flute concerto and trumpet concerto, the latter being warmed over Arutiunian which is crappy to begin with. I don't feel any urge to revisit any of JW's concert works though, I never listen to any of them. Most of them are why did you bother kind of dull. There is just so much other music I'd rather listen to. These days I am mostly just into Close Encounters and A.I. when it comes to JW.